County supervisors agreed on Tuesday in Los Angeles to retain a consultant to place air quality monitoring devices at the project site and evaluate the data publicly, among other actions. The sediment removal project, whose first phase began in late November, is expected to include 425 daily round trips by diesel trucks through the intersection at Berkshire Place and Oak Grove Drive and onto the 210 Freeway in both directions. In November 2017, supervisors approved a scaled-down project to remove 1.7 million cubic yards of sediment. Work started after a nine-year process that included feedback from local residents, environmental groups, the cities of LCF and Pasadena and the community of Altadena. The initial process includes removing sediment behind the dam at Hahamongna Watershed Park to restore habitat and increase flood protection within the Arroyo Seco Watershed. In late November 2018, work to clear out vegetation and trees began. Sediment removal will take place from May through November and from 2020-22, according to the project’s website at dpw.lacounty.gov/swe/devilsgate. Supervisors voted on Tuesday at a regularly scheduled board meeting to direct Public Works to use flood control district funds for the monitoring. The board also voted to pinpoint the placement of monitoring devices and partner with the California Air Resources Board and the South Coast Air Quality Management District to interpret and share data. The results will be shared on public websites and with an ad hoc community advisory committee from Barger’s Fifth Supervisorial District. The committee’s nine members will be from LCF, Pasadena and Altadena, and county staff will share information with them to improve the project, according to Barger’s motion. Officials are to monitor the project with an eye toward environment, health and public safety. Speakers who supported the motion included La Cañada Unified School District parent Elizabeth Krider, who holds a Ph.D. in chemistry and has worked at Caltech; Mark Evans, the district’s chief business and operations officer; Elyssa Nelson, Child Education Center’s executive director; La Cañada High School students Aaron Kornfeld and Stephen Krider; and Blair Hansen, who lives near Hahamongna Watershed Park. “As a student, I’m concerned for the safety of many of my peers,” said Kornfeld, who added the supervisors should monitor the air and implement a less aggressive truck schedule for the project. Barger thanked the speakers and added that the project’s accountability and transparency were important. “This motion truly did come from the feedback of the community,” Barger said. Tony Bell, spokesman for Barger, said by email that the cost of hiring the consultant would be determined by Public Works. 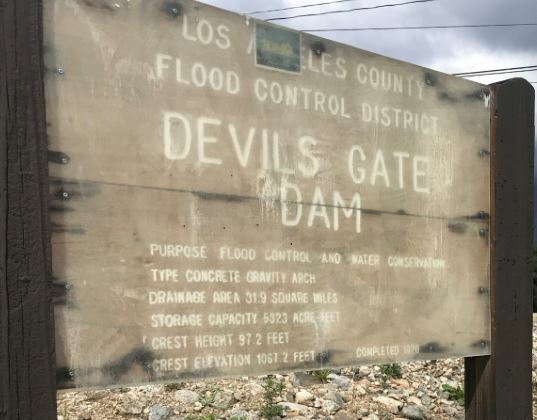 Meanwhile, it was revealed by officials at an LCF meeting of the Joint-Use Committee, whose members represent the city and LCUSD, that the start of the sediment-moving part of the project has been pushed back to May 7 from April 15. The meeting was held last Thursday at City Hall, where LCF Public Works Director Patrick DeChellis said the county is in the process of putting in a protected left turn from Oak Grove Drive to Brookshire Place to allow trucks used in the Big Dig to go east or west on the freeway. DeChellis said LCF is working with the Sheriff’s Department to get a deputy to control traffic every weekday afternoon until the signal is in and for a couple of weeks afterward. Most southbound traffic never has to stop unless someone pushes a red button to cross, DeChellis said. School board member Joe Radabaugh said it could take up to a year for the city of Pasadena to implement the signal — the area in question is near the LCF border with that city — and DeChellis said he was looking into it. LCUSD Superintendent Wendy Sinnette said the district has asked the county for the monitoring of air quality, filtration and emissions. “We have gotten them to agree to truck monitoring,” Sinnette said. Additionally, school officials have received assurance that the county won’t use trucks that were manufactured before 2010 or have been recalled, in hopes that the project’s vehicles will generate less pollution. Sinnette has raised the idea of a community safety plan under which the project would be slowed or stopped in the event of unhealthy air conditions, but has acknowledged it’s unclear whether the county would enter into it because of potential financial impacts. She noted the high school’s summer physical education course would be moved to the Foothill Intermediate School campus at Cornishon Avenue because of the sediment removal project.